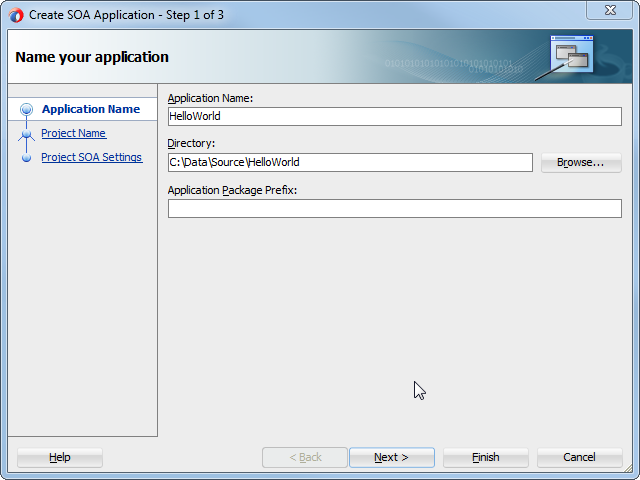 Long ago, back in 2004/2005 when Oracle released Oracle BPEL 10.1.2 (and its predecessor the global available release of the rebranded Collaxa product) and in 2006 with the release of the first SOASuite 10.1.3, you had a Project per BPEL process. 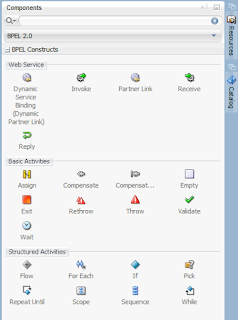 Each project was setup around the BPEL process file. 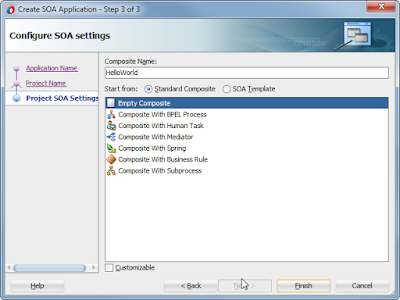 Since 11g BPEL is a component in the Software Component Architecture (SCA) and a project can contain multiple BPEL components together with other components as Mediator, Rules, etc. 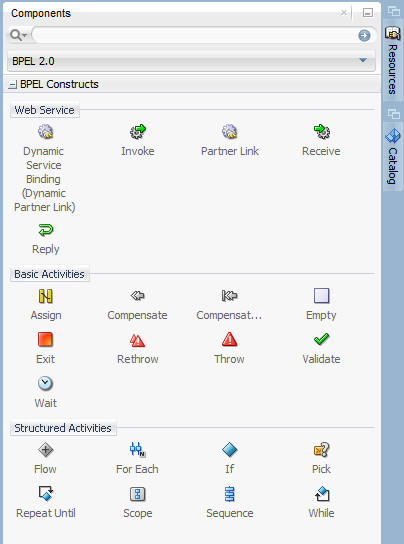 In a later section I'll elaborate on the SCA setup, but for now I'll focus on the BPEL component. When I do I probably edit this introduction. 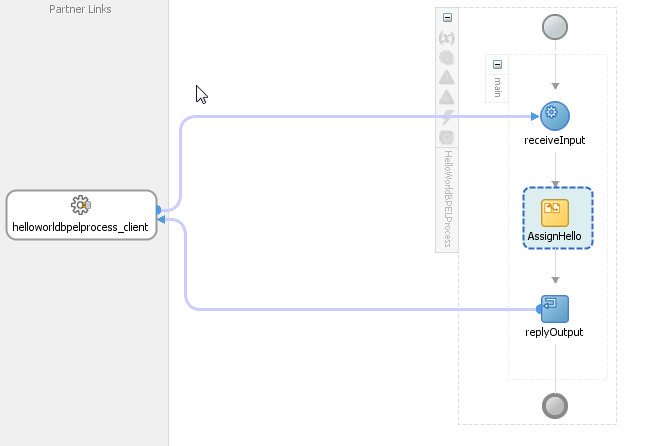 I had to make this introduction because using 12c we have to create a SOA Application with a SOA Project for our first BPEL process. I assume you have installed the SOA QuickStart. 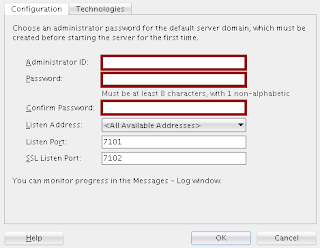 If not do so, for instance with the use of the silent install. 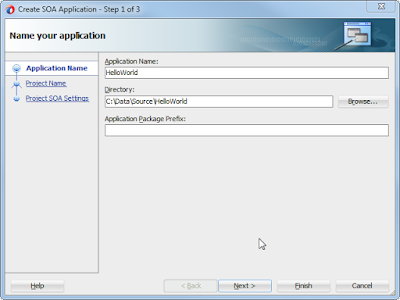 That article describes the installation of the BPM QuickStart, but for SOA QuickStart it works exactly the same, but you might want to change the home folder from c:\oracle\JDeveloper\12210_BPMQS to c:\oracle\JDeveloper\12210_SOAQS. 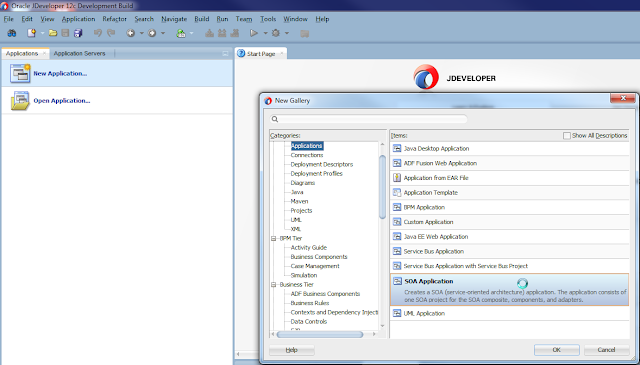 Then start JDeveloper from the JDeveloper home. 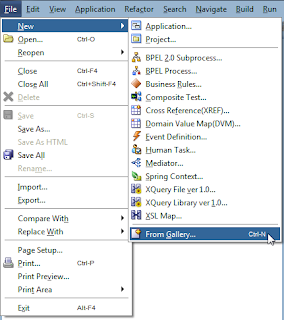 If you used the silent install option, then you can start JDeveloper via c:\oracle\JDeveloper\12210_BPMQS\jdeveloper\jdev\bin\jdev64W.exe. 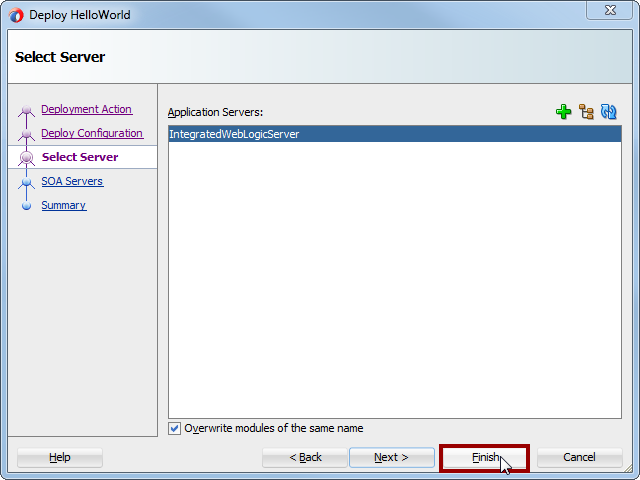 Name the application 'HelloWorld' and provide a Directory for the root folder for the application. 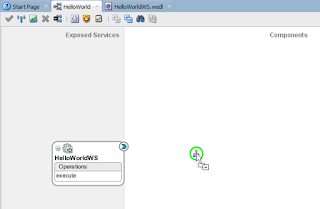 For instance 'c:\Data\Source\HelloWorld'. 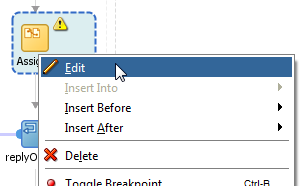 And click Next. 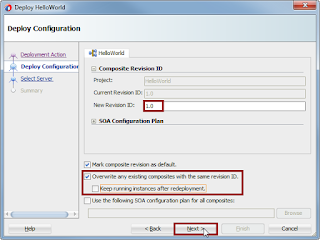 In the last step of the wizard you can choose a Standard Composite (with a start component) or a Template for the composite. You could choose for a composite with a BPEL Process, but for now, let's choose an Empty Composite, since we need to create a schema first. 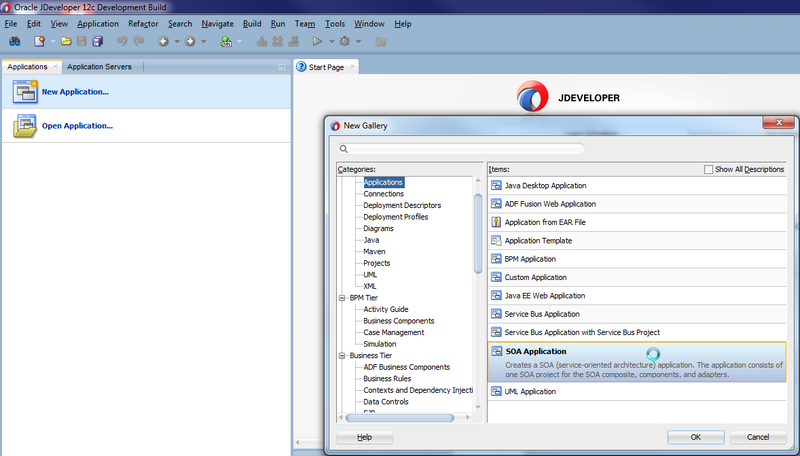 Top left you'll find the Project Navigator that shows the generated artefacts that you'll find in the project folder. 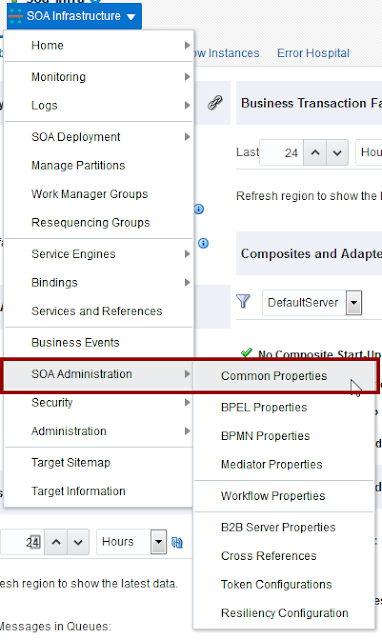 In the middle of the left panes you'll find a Resource Navigator which enables you to edit some specific property files in the SOA Application. But we'll leave them for the moment. 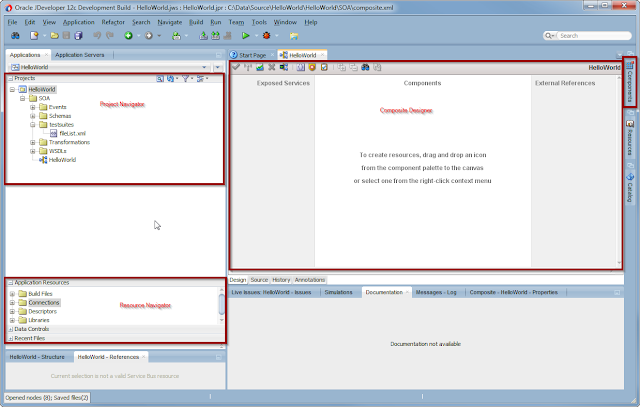 Bottom left you'll find two tabs, one of which is the structure pane. 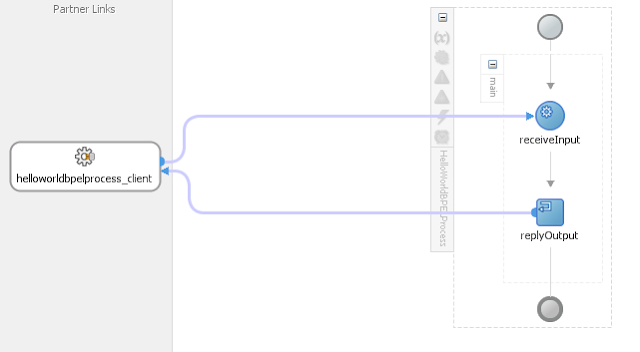 This one comes in handy occasionally, but we'll get into that later as well. To add components to the application you simply drag and drop than on the appropriate pane. 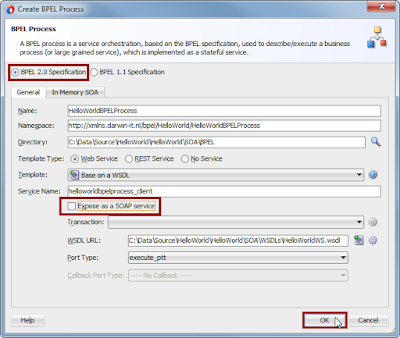 A BPEL process is exposed as a service in most cases. 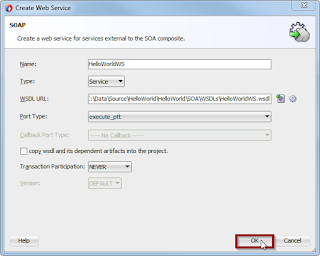 To do so you have to create a WSDL (WebService Definition Language) document. 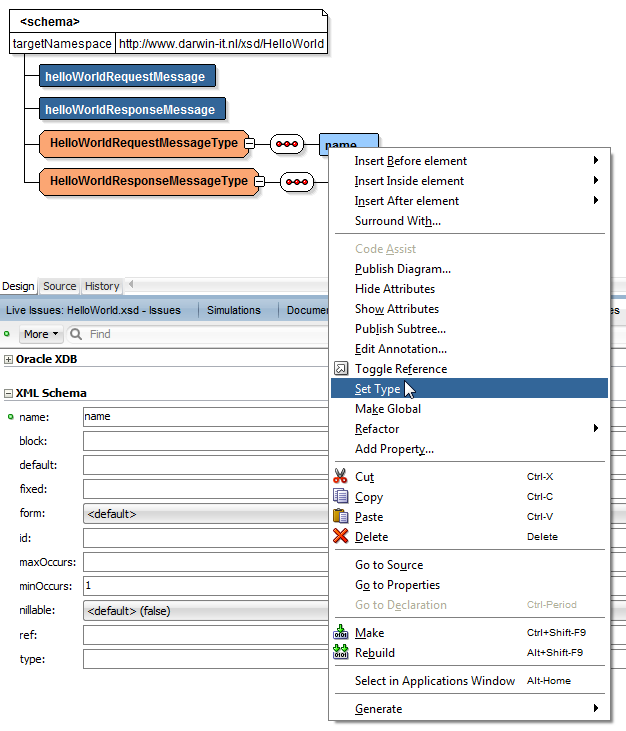 This is an interface contract for a service described in XML. 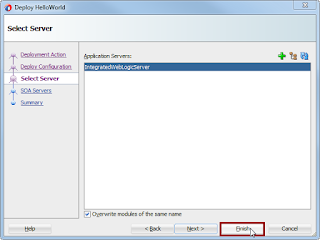 It defines the input and output of a service and the possible operations on the service. 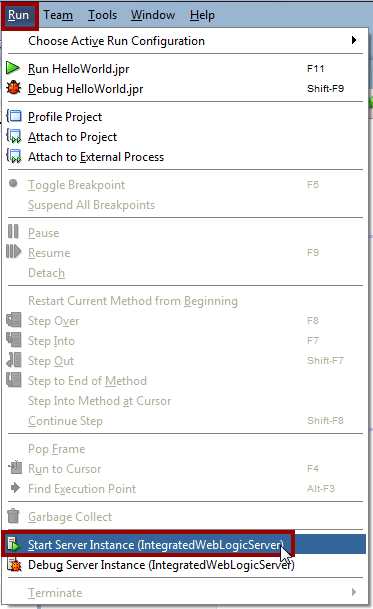 Each possible operation needs refer to it's input and possible output message. And each message refers to the definition of that message. 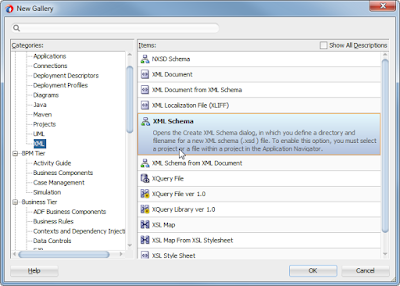 The message definition is done as an element in an XML Schema Definition (XSD). 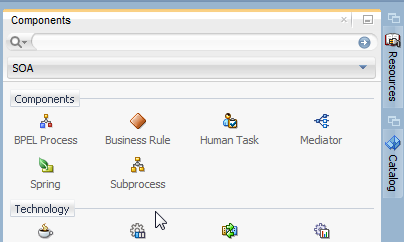 Although you can have it auto-generated, it's recommended to do a bottom-up definition of the contract. So let's start with the XSD. Change the name to helloWorldRequestMessage; I like to have elements have a proper name and in this case it's defining a request message for the HelloWorld service. 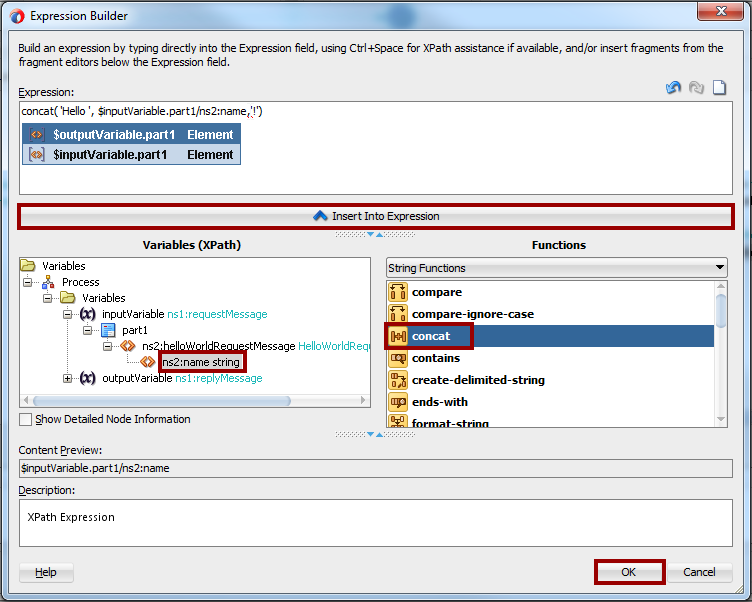 I use the Java Standard Camel Case notition where elements have a lowercase first character. 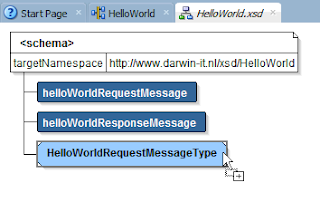 Name the new element helloWorldResponseMessage. 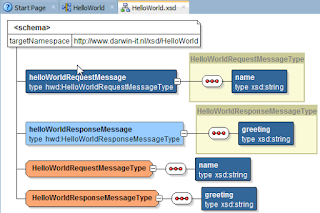 In the same way add a complexType and name it HelloWorldRequestMessageType. 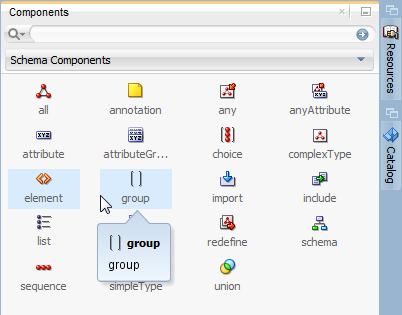 I don't like implicit nameless complexTypes within elements. 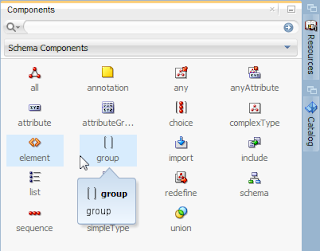 So I tend to always create named comlextypes, that I name the same as the corresponding elements, except for a UpperCase first character and the suffix 'Type'. 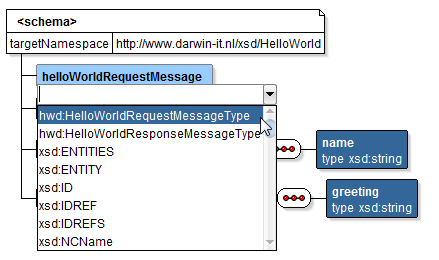 Do the same for complexType HelloWorldResponseMessageType. 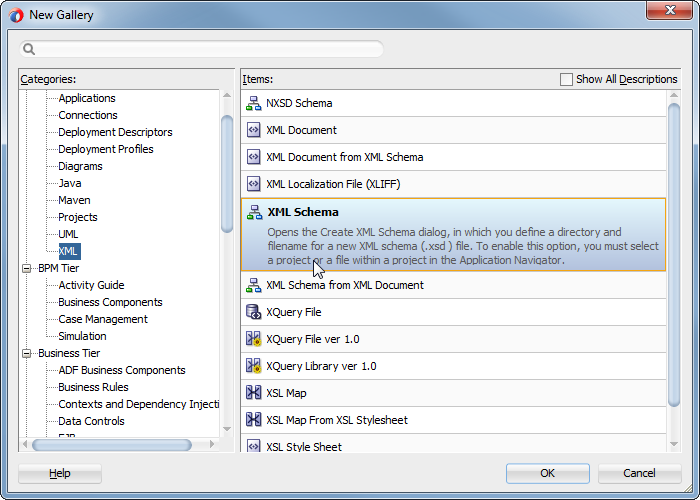 And in the sequence drag and drop an element called 'name'. 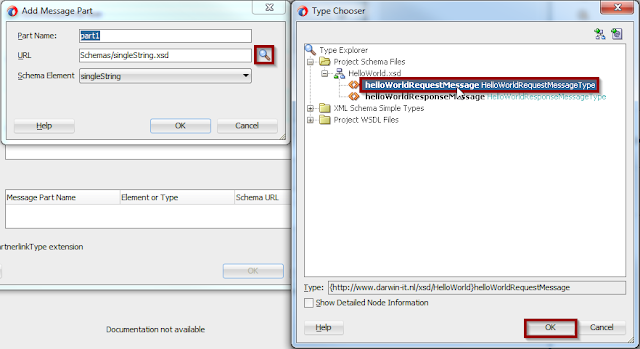 Do the same for HelloWorldResponseMessageType, except name the element 'greeting'. Set also the greeting element to xsd:string. 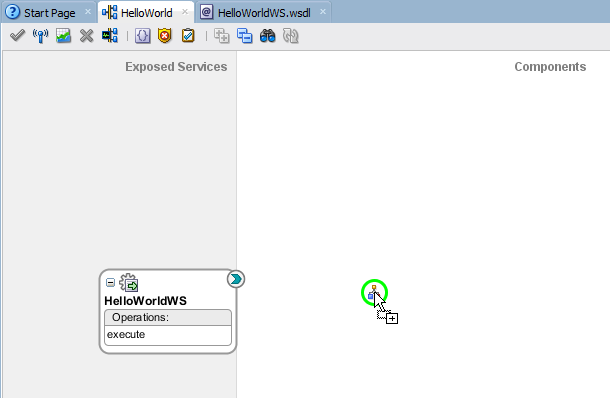 And the helloWorldResponseMessage to the type hwd:HelloWorldResponseMessageType accordingly. Now we can create a WSDL based on the xsd. 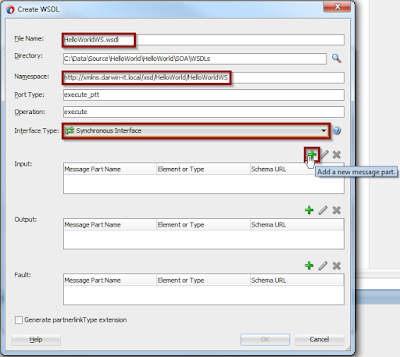 JDeveloper has a nice WSDL generator and editor. 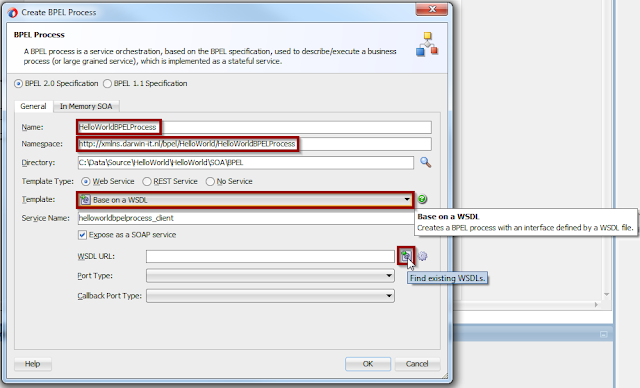 The name of the wsdl is pre-defined on the SOAP service, but you can leave the suggestion. Do yourself a favor and provide a sensible namespace. 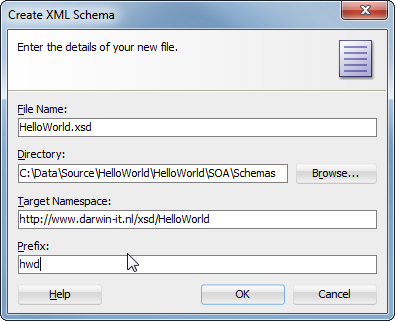 I choose 'http://xmlns.darwin-it.local/xsd/HelloWorld/HelloWorldWS'. 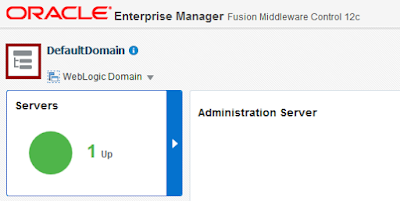 Think of a good convention where you have a company base url (I'll get back to it later, but for now it's common convention to use an URI, that does not need, in most cases even don't, refer an actual existing internet address). Back in the Create WSDL dialog, you can leave the names for Port Type and Operation, to the proposed values. For this service execute is a quite proper name. But in the future it is wise to think of a proper verb that gives a proper indication of what the operation means. Later when I'll discuss WSDL's you'll find that a WSDL can hold several operations and porttypes. 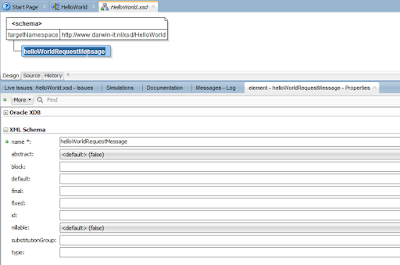 This will bring up the following dialog. 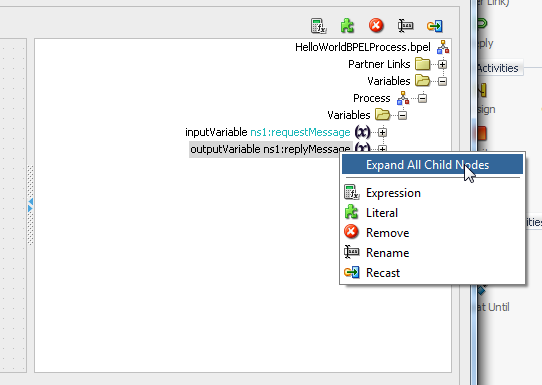 The namespace is not really important here, you could leave it at the suggested value. 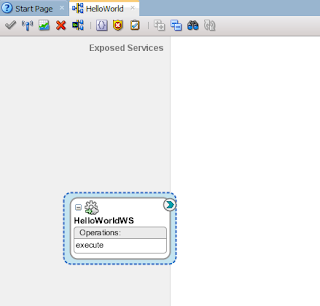 It's only used internally, not exposed since we're using a pre-defined wsdl to expose the service. 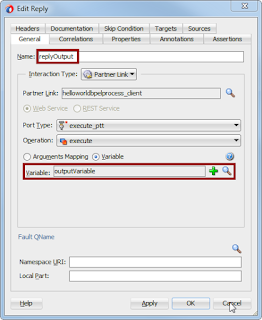 However you can change it to a proper value like here to identify it as a BPEL created by you/your company. 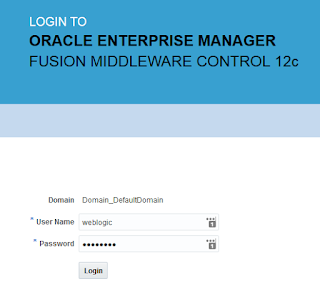 This can be sensible when using tools like Oracle Enterprise Repository. 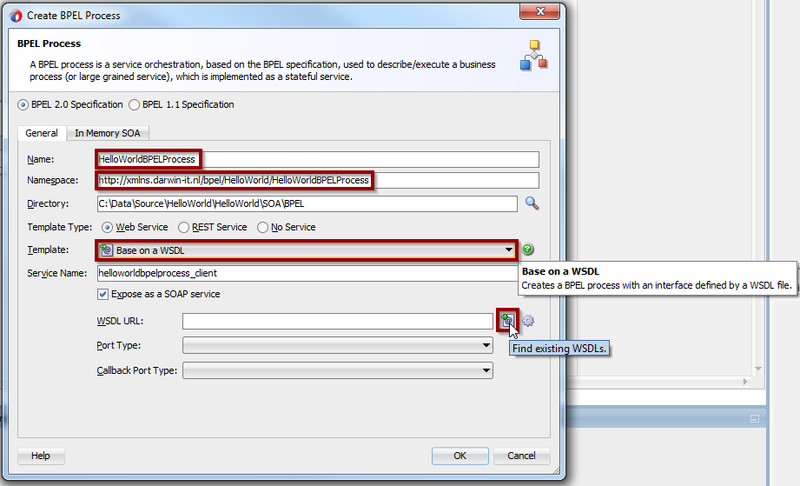 But especially when you generate the wsdl by exposing the BPEL process as a SOAP service. 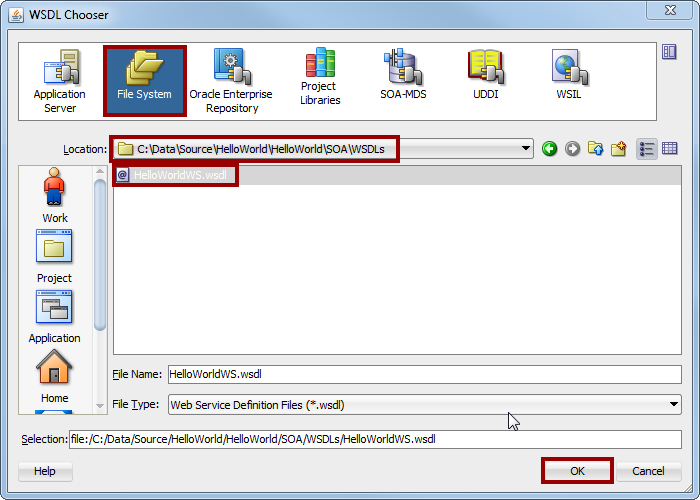 Within the project navigate to the WSDLs folder and choose the HelloWorldWS.wsdl, and click OK. 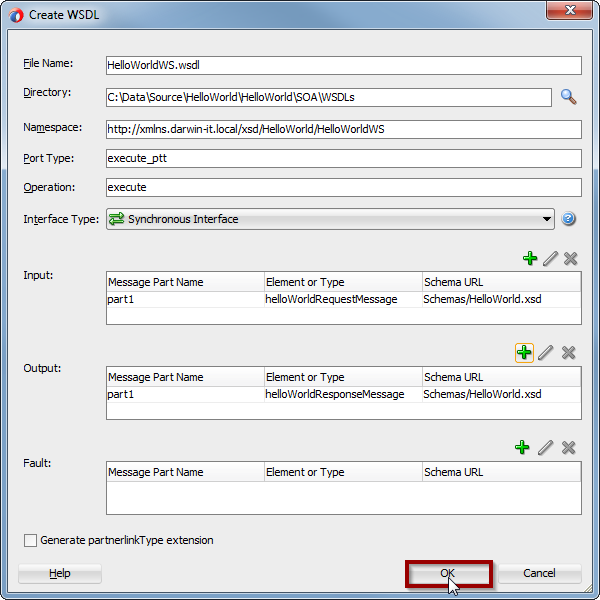 This will bring us back to the Create BPEL Process dialog. Important here is to deselect the 'Expose as a SOAP service' checkbox, since we want to reuse the already defined SOAP service, instead of having a new service generated. 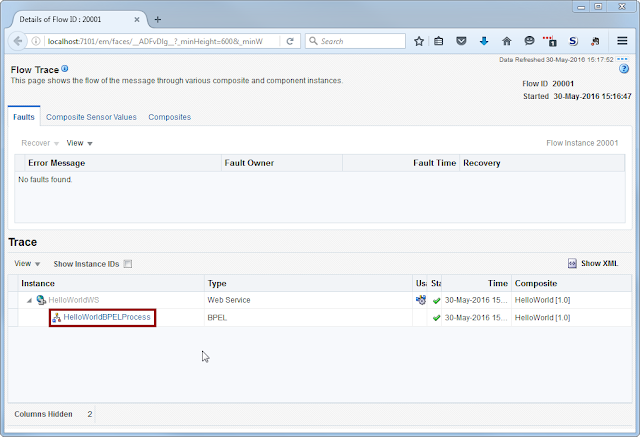 In the case you missed this, and a new service is generated, you can delete it easily. You'll see that a green line appears between the start icon, that gets a green circle around it, and the possible target icons. 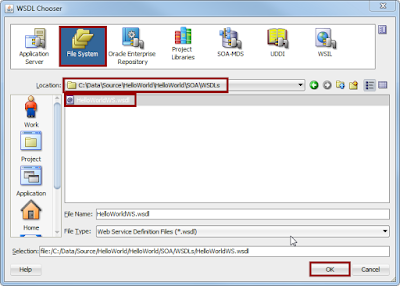 It shows a so-called 'Partner link' to the left. 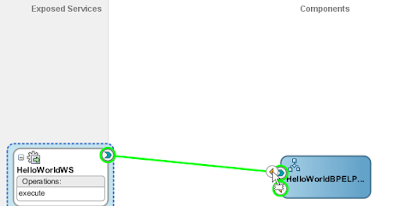 There are two 'Partner Links' Lanes one on each side of the process. They're equal, the designer picks out a lane for each new Partner Link as it finds appropriate, but you can drag and drop them to the other side when it suites the drawing better. 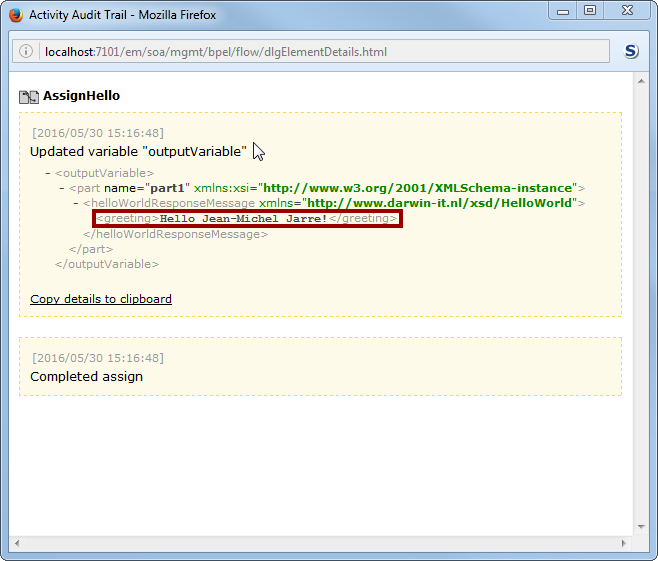 But the so-called client Partner Link is always shown left at start, and it is common to have it left. 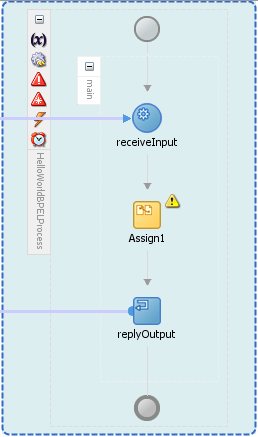 Then you'll see two activities in the process in the main-process-scope: receiveInput and replyOutput. 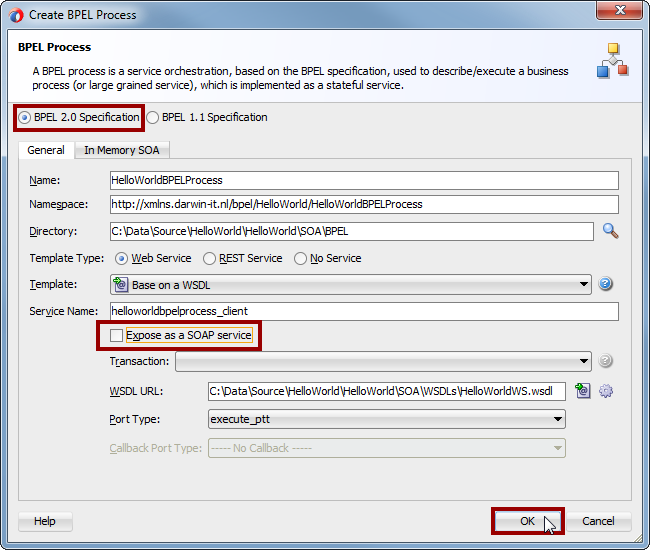 The first receives the call and initiates the BPEL Process. 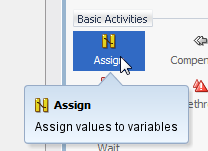 If you edit this activity, you'll be able to see and edit the name of the activity. 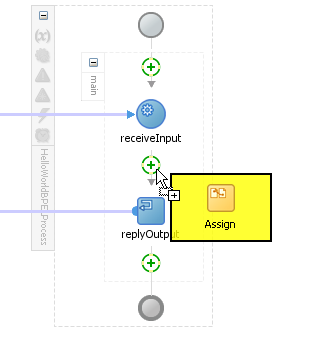 It shows the input variable where the request document is stored. 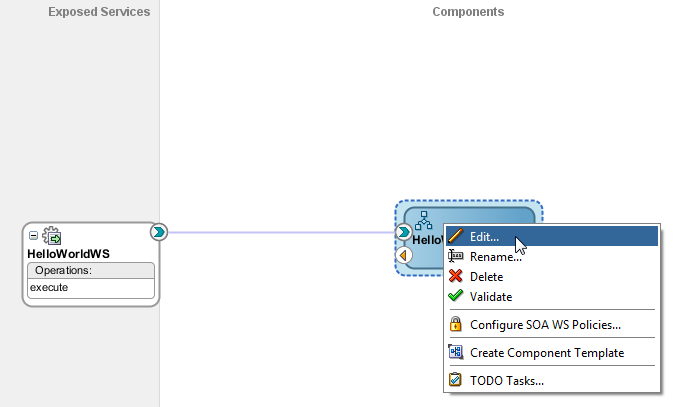 And very important the checkbox 'Create Instance' is checked. 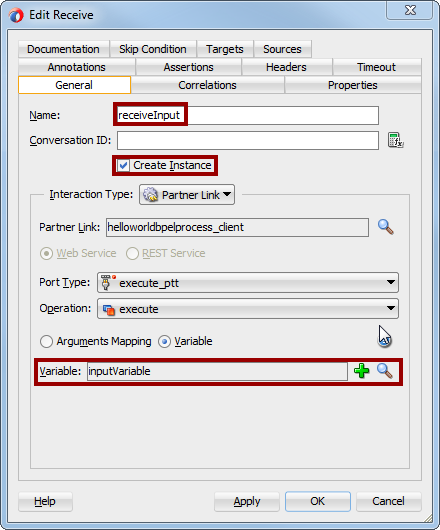 This means that this is the input activity that initiates a process instance. 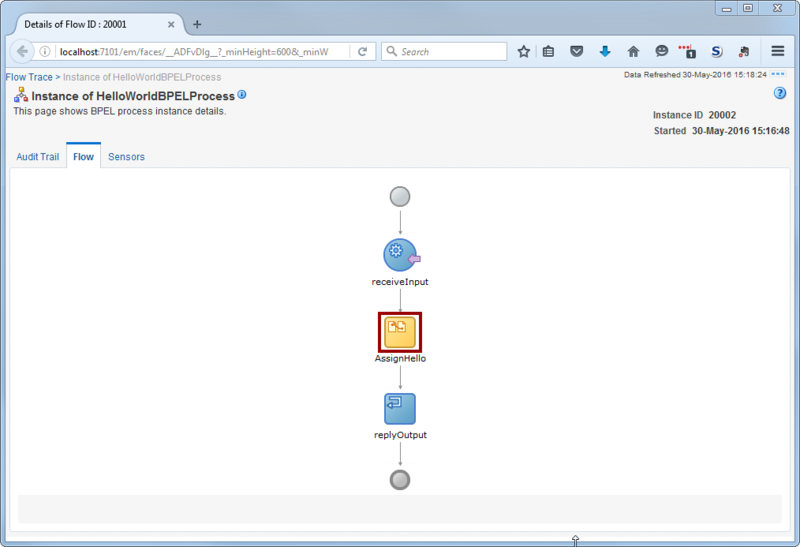 It is very important that this is the very first Receive or Pick activity in the BPEL process. The Reply activity is the counterpart of the first Receive and is only applicable for a synchronous BPEL process. 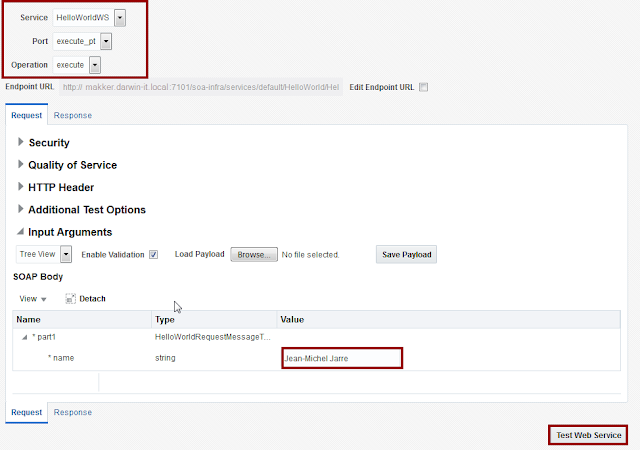 It responses to the calling Service Consumer with the contents of the outputVariable. 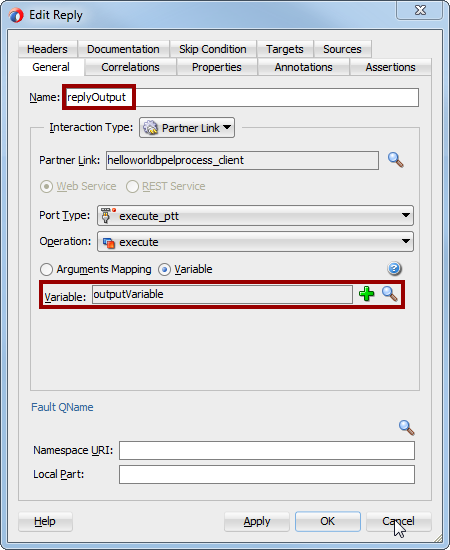 So in between we need to build up the contents of the outputVariable based up on the provided input. 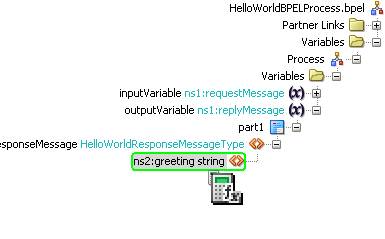 Here you see that an element of the inputVariable is used in a function to build up the greeting. 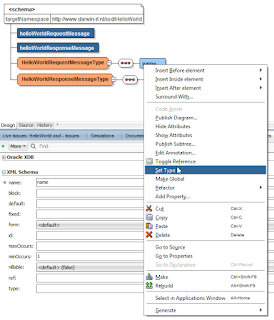 For more complex XSD's you can add several copy rules, as many as needed, just by drag and dropping elements to their target-elements. 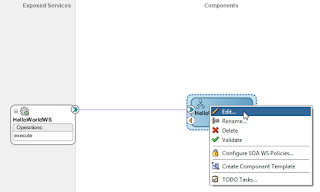 For now, the assign is finished, so click OK. 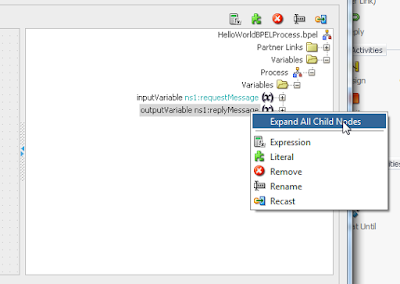 Your process now looks like the example above. 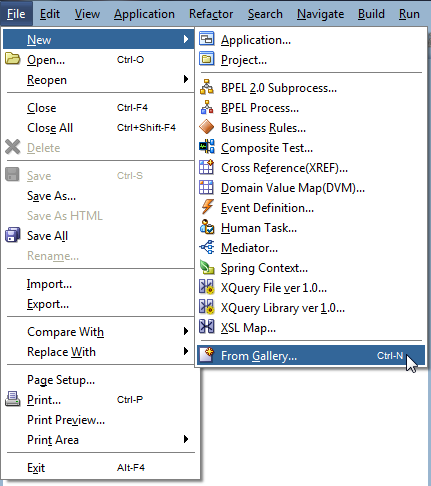 Save the process by clicking the Save or Save All, that look like the old-school floppy disks. 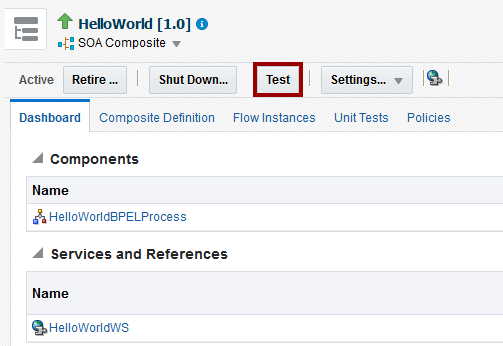 To be able to test the BPEL process, we'll need a SOA Server. 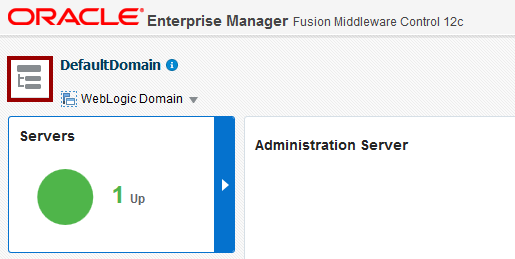 At a real-live project, a proper server installation will be provided to you and your team (preferably and presumably). 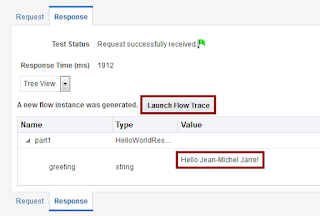 This is recommended even for development to be able to do integration tests for a complex chain of services and to be able to work against enterprise databases and information systems. 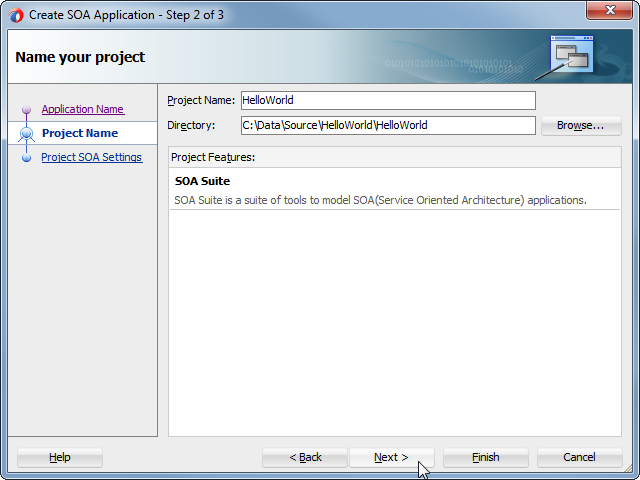 IntegratedWebLogicServer startup time: 363761 ms.
Now the SOA Suite Server is available to receive the HelloWorld Composite and do some tests. 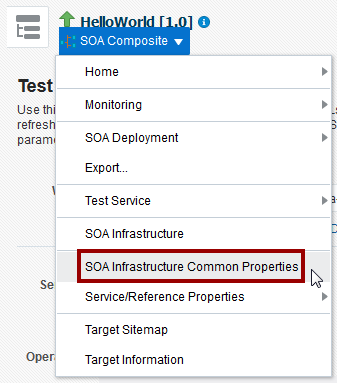 Deploying a SOA Composite is a kind of special way of deployment that differs from deploying a regular Web Application. 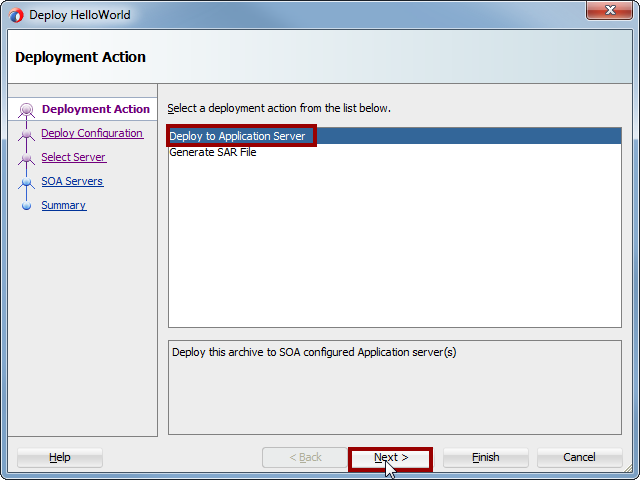 Although you can find a deploy menu option in the Application menu of JDeveloper, this one is not suitable for SOA Composite deployments. For SOA Composite projects, you need to right-click on the project name and choose Deploy and then the name of the Project. 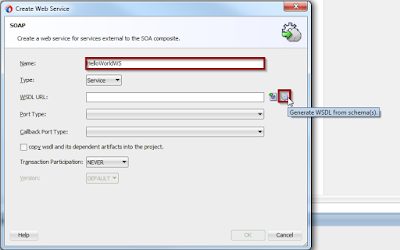 A SAR file is a so-called SOA-Archive and is used to be able to have the project deployed by an administrator to a target environment without the need of JDeveloper. 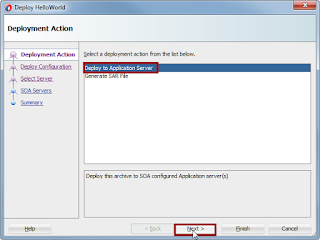 Choose the option Deploy to Application Server and click Next. 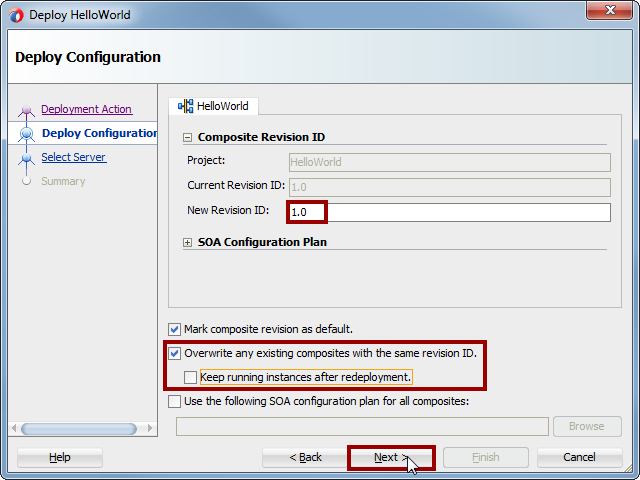 In the next page, select the Overwrite any existing composite with the same revision ID checkbox, but deselect the Keep running instances after redeployment. 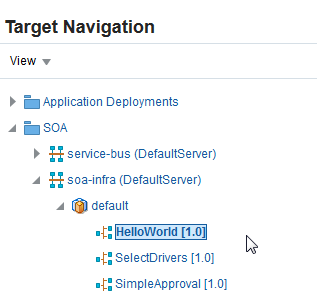 Although this is the first deployment (so there are no existing running instances yet), after this deployment you'll find that this sort of profile is added to the deployment context menu, and not checking the Overwrite... option will cause a failure in the next deployments. 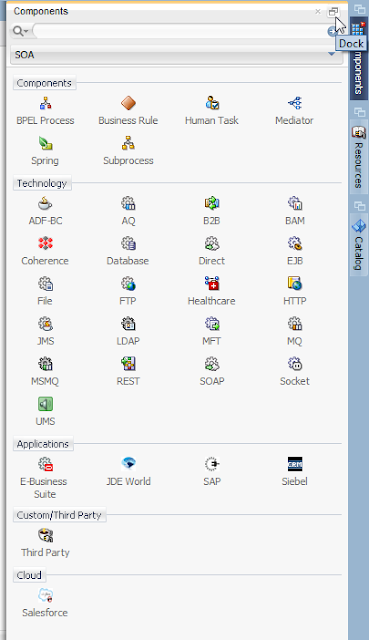 But there's no need to keep existing instances running. Keep the Revision ID. Click Next. 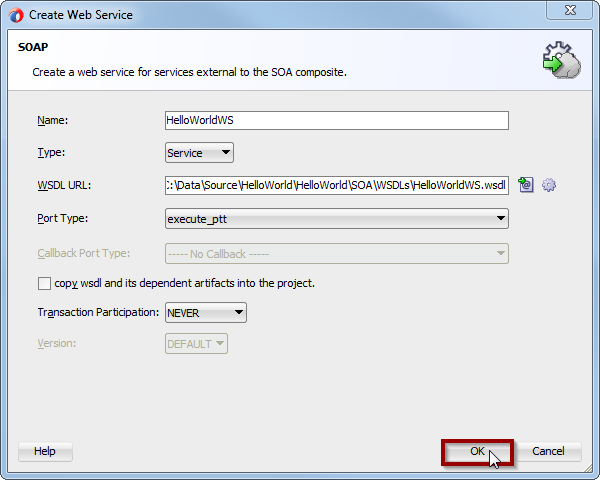 Select the pre-defined IntegratedWeblogicServer and click Finish. If you've done everything ok, then a BUILD SUCCESSFUL message is shown. 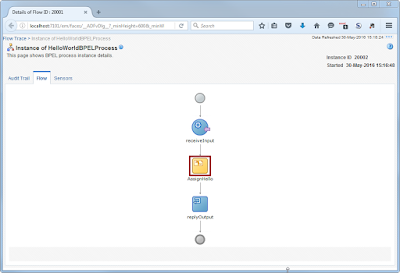 By the way, alhough it might not be clear to you, the integrated build-tool Apache ANT is used for this. 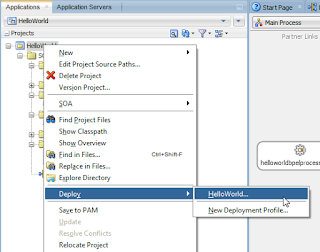 When the BUILD SUCCESSFUL message is shown, you can switch to the Deployment tab. 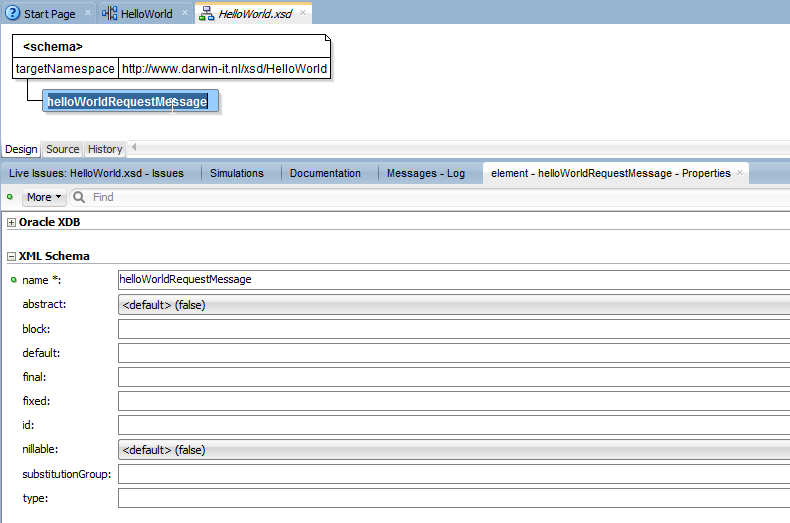 After building the SAR it is send to the weblogic server. 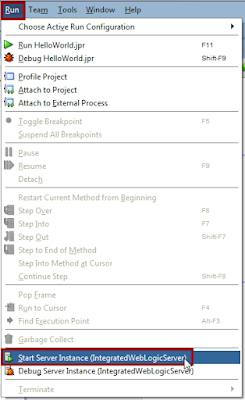 If this finishes without errors you'll be able to test it. 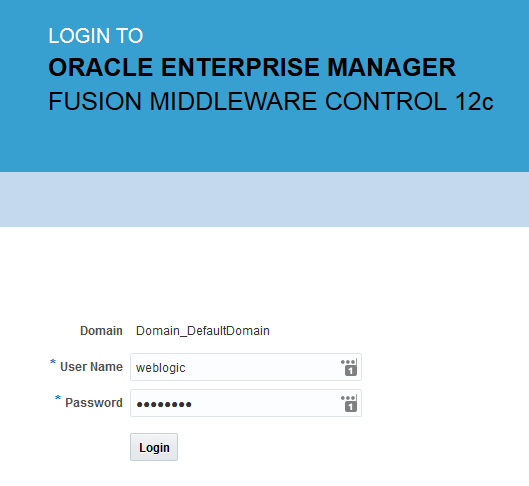 Testing and monitoring the SOA Composite instances can be done using the Enterprise Manager - Fusion Middleware Control. 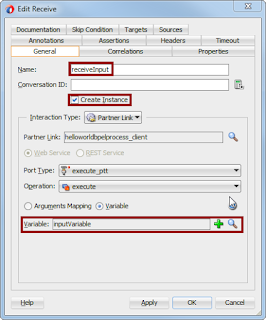 Use the credentials you used to start the IntegratedWeblogicServer for the first time to login. 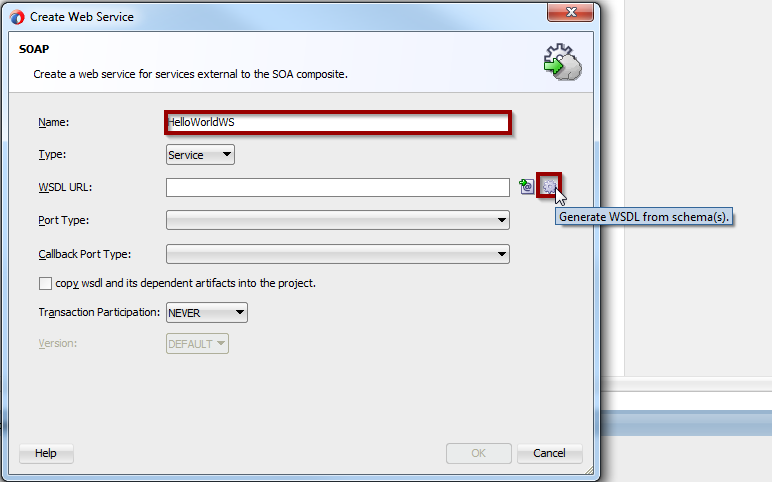 Here the SOA node contains both service-bus projects and SOA Suite (soa-infra) Composite Deployments. The node Default is actually the Default partition. 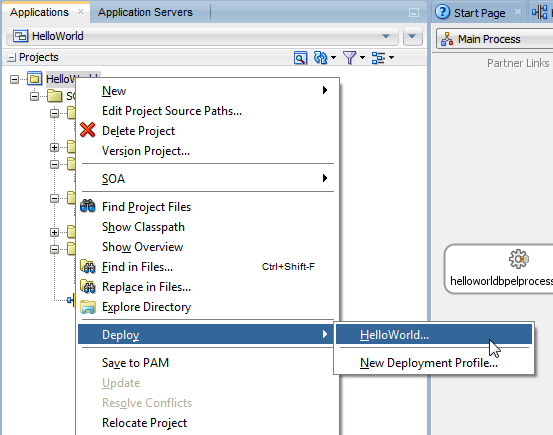 You can create several partitions, to catalog your deployments. 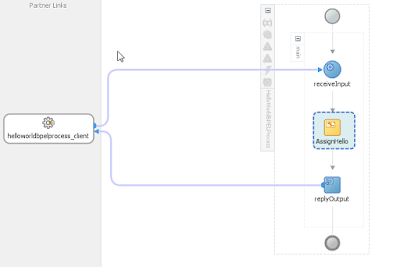 The flowtrace shows the different initiated components in the flow in a hierarchical way. Here you can set the Audit Level to Development. Click on the Apply button to effectuate the change. 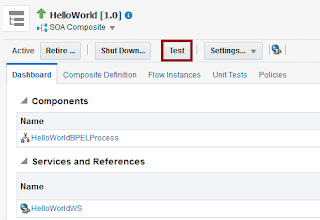 Do another test and check-out the BPEL Flow and review the message contents. In next articles I hope to slowly increase the level of the subjects. 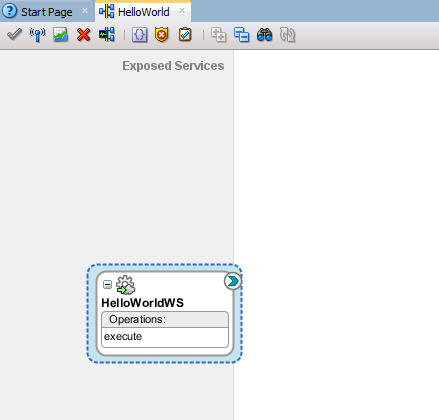 Coming up: invoking other services and using scopes. 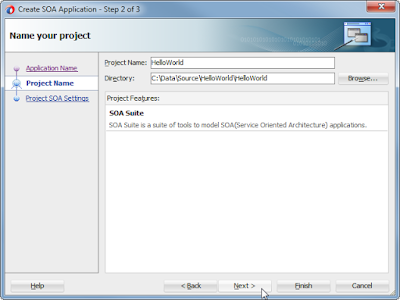 But probably I need to explain something about SoapUI to provide mockservices. 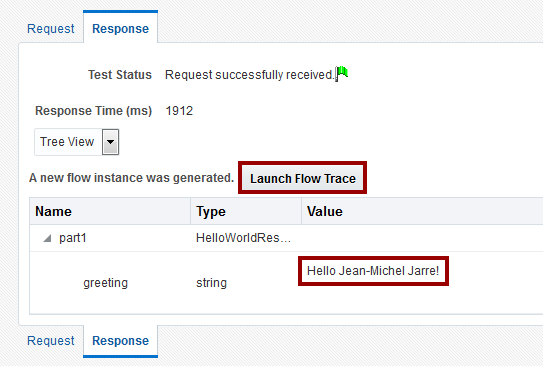 And to deliver a more convenient way to test your services.